Great question! Nothing worse than a non-crispy roast potato, amirite? Oh it parboils my blood! Makes me wanna smash. Makes me wanna take off out of my body and cause mischief. Set fire to a few cars, that sort of thing. The sadness in cutting into an imperfect “roast” potato. You just know, straightaway, there is nothing to hide behind. I’m getting angry just thinking about it. 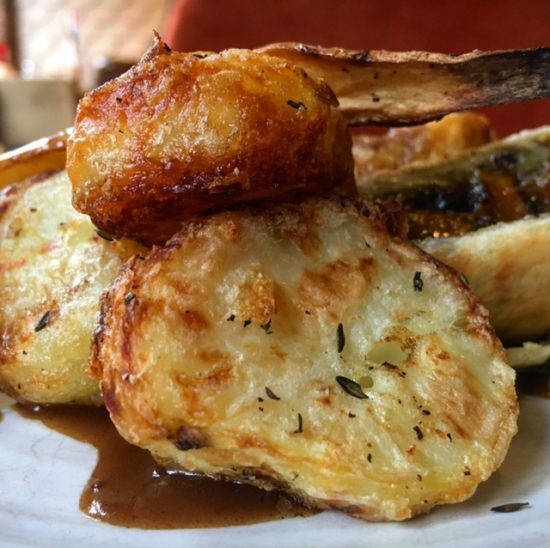 To make the ultimate crispy roast potato, you first must think like a roast potato. Try it! Tuck up into a ball and submerge yourself in a hot bath, drain thyself and roll around in olive oil, apply salt and pepper liberally (you might want to wear goggles), crank your central heating ALL the way up and just sit there naked on a baking tray. Don’t move. Don’t even blink. Transfer yourself to a plate (trimmings optional) and then sit there until you are air-lifted to the safety of a giant’s mouth. – Put oven tray with a liberal smear of fat into a pre-heated oven at 200C. – Peel and chop your spuds (Maris Piper / King Edward / Brian Harvey) into halves or quarters depending on their original status. – Parboil in a large pan for three minutes, a rapid rolling boil. – Drain potatoes in a colander and toss with wild abandon to “rough” the surfaces. – Take the potatoes outside to a car park and kick about a bit. – Once sufficiently fluffed up / “broken”, empty the potatoes into a large bowl and toss with olive oil and salt and pepper. – Dethrone in a single layer onto your preheated baking tray and place into the oven. – Cook for 15 minutes. Looking through the oven window occasionally and saying things like “You remind me of a younger me” or “Are you up to anything this weekend?”. You’re the good cop at this point. – Remove from oven and flip over the potatoes. Return to the oven for 15 minutes. – Return to the oven for 15-20 minutes. – …Immediately after you’ve looked at them disapprovingly and said something like “Your cousin Bryan is a doctor now AND he lives in a modern flat in the city centre”. At this point the potatoes will be crisping out of their skin and ready to take money out of your handbag and steal your car. Just where you want them. – Tap with the back of a wooden spoon just to make sure they are peak crunch. Then tap yourself with the back of a wooden spoon to wake yourself up…it ain’t happening, baby. You’re never doing anything good at home. Like a loser. Come to Common for your Christmas dinner instead. Serving it up throughout December. Menu HERE.